Some people believe that charity organizations should give aid to those in greatest need, wherever they live. Others believe that they better concentrate on helping people who live in their own countries instead. From a practical point of view, resources are more effective when delivered to those who pressingly lack them. It is perceived to be more useful, as it directly addresses the problem at hand. In an ideal world, the aid that was donated would be equal to the aid received. Yet the fact remains that a percentage of this aid is lost along the way before finding its beneficiaries: conversion rates could be harsh, banks and other financial services companies charge high commissions, there’s tax to be dealt with… In short, there’s a certain level of fungibility in these funds, where aid can become “hostage” to the local context. That is why not only aid effectiveness should be considered when allocating donations. Costs and benefits also have to be taken into account when deciding how to dispose of available resources. In this regard, economists would try to convert the dilemma into a mathematical formula: see if there are patterns that would lead to the best choice, and try to predict a final result of their analysis. Still, the choice is not really between helping a population “in need” and one that has “better location”. The question actually lies in how charity organizations manage themselves, whose own funding mostly comes from subsidies, grants and/or donations. As a matter of fact, non-profits are accountable to their donors, binding them to comply with the specifications detailed out by their patrons regarding the use of funds. Oftentimes, they are also required to report about the funds’ impact to the community, or at least to the target population (but this is a subject for another essay). Therefore, the choice of which people to serve does not lie entirely in their hands. A more balanced approach would seem to be reaching an accord to meet donors’ objectives while respecting the realities of both the organization and the community he wishes to help. This means donors would have to be engaged (at least the major givers) by the organization to take an active part in determining how best to allocate their contribution. The initiative would call for a constant and consistent communication from both parties. This offers a win-win situation because on one hand, regular contact would allow the donors to disclose their motivations for making such a contribution. For instance, they could make the organization understand their emotional connection to the beneficiaries. On the other hand, organizations could take this opportunity to better explain their activities to their patrons. This could be a good moment to make them see that a strong infrastructure and qualified professionals are required to deliver aid to those who are in need; and as such, funding has to be allocated to these operational aspects as well. Only through communication can the two ends find a middle ground that would allow each of them to carry out their respective mission statements. A typical philanthropist would think and argue about improving the lives of those in greatest need; while a typical economist would compute the costs in terms of time, effort, phone bills and transportation that result from the continued communication between donors and organizations. Both would have good points to defend their views. “So, you are interested to be a prospect researcher?”, asked the French head hunter. If I had one confession to make in this blog, it is that the first job I got in France was one I didn’t know anything about… I replied to the ad because it seemed like an organization was looking for a researcher. But until I had the first interview with the recruiting agency, I didn’t exactly understand what I applied for. It was embarrassing to be on the phone, sneaking from my former boss, and having to admit that as good a researcher as I am, it was the very first time I’ve heard of Prospect Researching. I do not recall how I saved face during the interview, but somehow I was able to convince her that I’m an ideal fit for the job. I suppose it was through a strike of luck that the head hunter assigned to me was a kind, considerate one. She didn’t blame me for cluelessly applying for a job. And how could she? when the very foundation of Prospect Research is still taking baby steps in Europe: the Philanthropic sector. In philanthropy, the main activity that moves resources is Fundraising. Surely, you’ve heard all types of fundraising campaigns for a wide range of causes from fighting hunger to combatting illnesses. It is mostly the non-profit organizations that use fundraising to, well, raise funds. As opposed to investment, the donor does not receive any monetary value in return. But a recognition in one form or another is always offered (naming facilities after a donor like “Ismid Family Library”, setting up a plaque of appreciation or a giving symbolic like a fountain pen or a trophy). Many non-profit organizations are resorting more and more to soliciting donations in order to sustain their activities; especially after the recent economic downturns, which have certainly reduced investments in their enterprise. Almost all of us have witnessed how different associations raise funds in the streets: they either ask for a one-time donation or request for a longer-term commitment. What prospect reasearch does is to streamline information so that fundraisers know exactly who to target and how to enlist the “prospects” for a more stable and continuous organization-donor relationship. 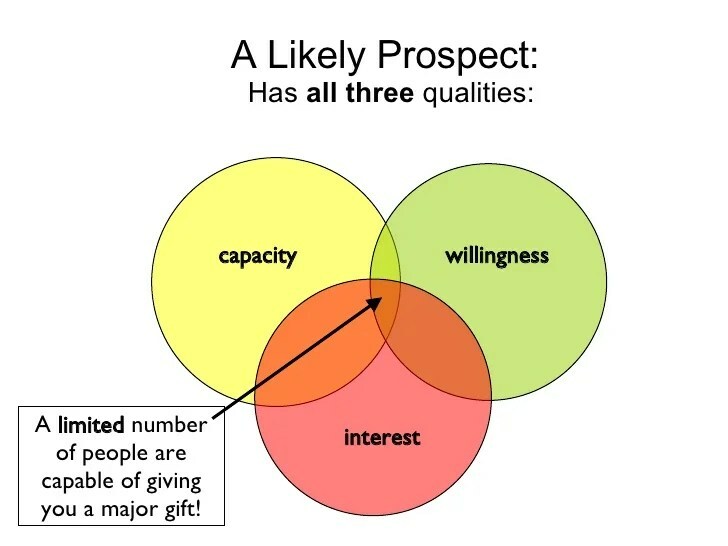 Prospects are defined as probable donors, and they could mainly be a company or an individual. Given my personal experience, I choose to consider prospects as individuals in this post. The best way to identify a prospect is to investigate how he is linked to the organization that needs the funds. Is he an alumnus/current member of the organization? Is he a parent of an alumnus? Is he a parent of a current student? Is he a board member? Is he in any way interested in the mission and vision of the said organization (interest)? Has he made or is he currently making donations to similar causes (willingness)? And most importantly, does he have the resources (capacity)? Fundraisers want to know almost anything there is to know about a prospect, but the most important information they need is the person’s capacity to give. All of us may agree that receiving a one-time donation of 1M Eur is much more efficient than asking for 2K Eur 500 times. helping strategize Stewardship tasks (recognition and continuous engagement of donors). You may notice that the prospect turns into a donor once he has made a gift (another term for donation). 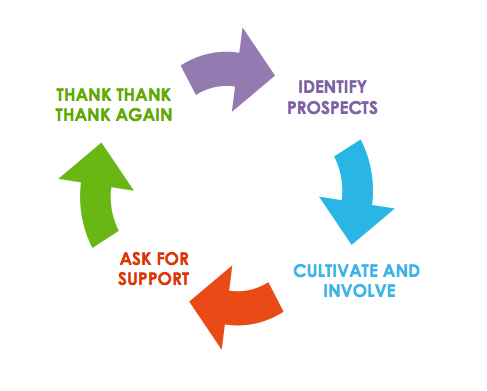 The cycle comes to full circle when the donors’ information is updated and they are once more identified as prospects for another round of solicitation/fundraising activities. The theory seems to be fairly understandable, logical and well-organized. However, as is everything in this colorful life, it is the reality that gives problems of execution. In prospect researching for example: for the world’s richest people, information is readily available at Forbes, Bloomberg and other periodic publications online (mostly this information is accessed for free) or in hard copy. There are even wealth search tools available that estimate a person’s assets and cash flow (not for free); and the principle would still be the same: the more famous the person, the more information you have. … what are you to do? As it turns out, this kind of dilemma is what made the job even more interesting than I expected- this is where prospect researchers would turn to other sources of information such as: Facebook (FB), LinkedIn, Instagram, news articles and- why not- gossip columns. For example, after I reported about a prospect’s FB content he ended up being completely disregarded due to the conclusions drawn about him (too many inappropriate pictures and male chauvinist jokes). The organization didn’t want to be identified with someone like him. And what about that time when I discovered that the heir of a vast family fortune in France is said to be addicted to poker? I had to look for more than 5 news articles/interviews just to assure the fundraisers that there might be some truth to it. Or when I learned that a very famous former member of the organization was once married to an English aristocrat? This is important so that when the assigned fundraiser approaches her the topic could be treated with tact, or not treated at all. Lastly, what about that week I spent digging up information about a prospect’s properties (a castle here, a manor there, several farms somewhere…), then it turns out he’s an octogenarian? I also found out that he’s being approached by fundraisers from various organizations to propose to him about leaving a legacy gift. I had to report this to the manager so they could adjust their expectations with regards to this prospect’s willingness to give. How is this interesting career-wise? The most obvious answer would be the fact that Philanthropy is slowly but surely rising in importance outside of the U.S. and U.K. (where it is of such high relevance). People who are interested to dedicate themselves in this kind of job would find that opportunities will gradually present themselves (perhaps sooner in some countries, later in others). But focusing on the research aspect of this sector, I found that I was able to develop and strengthen certain skills. Fast reading: there is so much to read! Fast writing: there’s even more to write! Patience: sometimes people who ask for research materials change their minds. They might re-focus the research from another angle or change the subject altogether. It helps to think that all of it is for the best (which would be translated to $$$, literally!). Efficient time-management and multi-tasking: most of the times a researcher would be requested to submit various materials with the same deadline. These materials are not necessarily identical in length, content or effort needed to be produced. Network building: some important and “juicy” information would come from the people you meet outside the organization. Having said this, hearsay and rumors are not going to be taken seriously as research material, but fundraisers would appreciate knowing them (as long as they have been warned that those are in fact merely rumors). Genuinely enjoying the job: I believe this is a pre-requisite for ANY type of job. Enjoying what you do, truly loving what puts the bread on your table will make the day-to-day travails easier to handle. Enjoying doesn’t mean not encountering any problems, though. Enjoying in this context means that no matter what problems you face, you are always ready and open-minded for the alternatives because you want to solve them. Everything I learned and everything I have shared is the product of the handover process plus the 5 months I spent filling in for this job (it was a replacement for someone who went on maternity leave). It’s such a pity I wasn’t able to stay in that department to learn more from the original Prospect Researcher. But I am very grateful for that short period of discovery from such an insightful person. These were actually the qualities that fundraisers appreciate about her, and which I worked hard to develop to a higher level. I can proudly say that this job has helped me grow both professionally and personally. So, are you interested to be a prospect researcher?